HeRC researcher Dr Katherine McAllister had cause to celebrate recently when she successfully defended her PhD thesis. Katherine’s thesis entitled “Coronary revascularisation in the UK: using routinely collected data to explore case trends, treatment effectiveness and outcome prediction” showed how she had delved into two nationwide audit datasets to understand more about the characteristics of patients undergoing percutaneous coronary intervention (PCI) and coronary artery bypass grafting (CABG) procedures. From the data, Katherine was also able to evaluate the outcomes of different surgical techniques and understand more about their effectiveness. She additionally developed a risk model to predict 30-day mortality following PCI, for use in future clinical audits. Katherine said: “My PhD shows that routinely collected health information can be used to gain insights into clinical care quality and service delivery. Alongside her PhD achievements Katherine also organised a well-attended eHealth event at The Royal Society of Medicine. 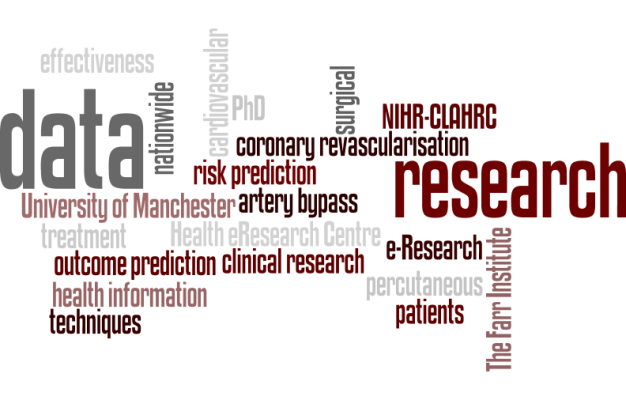 This one day masterclass attracted digital health colleagues from across the UK-wide Farr Institute for Health Informatics and helped open-up opportunities for collaboration between a number of health data science stakeholders. Katherine has recently started work as a Technical Analyst at NICE (National Institute for Health and Care Excellence). Her work involves the collection and synthesis of evidence to help guideline development groups make decisions about future treatment options and care pathways. Katherine’s PhD was funded by an NIHR-CLAHRC studentship and her supervisors were Prof Iain Buchan, Dr Matthew Sperrin and Prof Ben Bridgewater. The data for her work were provided by the British Cardiovascular Intervention Society and the Society for Cardiothoracic Surgery.